Ethiopian Americans are Americans of Ethiopian descent, as well as individuals of American and Ethiopian ancestry. In 1919, an official Ethiopian goodwill mission was sent to the United States to congratulate the Allied powers on their victory during the First World War. The four-person delegation included Dejazmach Nadew, the nephew of Empress Zawditu and Commander of the Imperial Army, along with Blattengeta Heruy Welde Sellase, Mayor of Addis Ababa, Kentiba Gebru, Mayor of Gondar, and Ato Sinkas, Dejazmach Nadew's secretary. 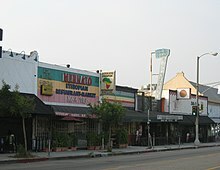 Ethiopian businesses along Fairfax Avenue in Little Ethiopia, Los Angeles. After his official coronation, Emperor Haile Selassie sent forth the first wave of Ethiopian students to continue their education abroad. Almost a dozen Ethiopian students likewise went to the United States. They included Makonnen Desta, who studied anthropology at Harvard, and later became an interim Ethiopian Minister of Education; Makonnen Haile, who studied finance at Cornell; and Ingida Yohannes, veterinary medicine at New York University. Three other students - Melaku Beyen, Besha Worrid Hapte Wold, and Worku Gobena - went to Muskingum, a missionary college in Ohio, two of them later transferring to Ohio State University. Melaku Beyan, who was one of the two who attended Ohio State, later received his medical degree at Howard Medical School in Washington, D. C.
An Ethiopian restaurant in Hartford, Connecticut. An Oromo Lutheran ( P'ent'ay) church in Minneapolis. Embassy of the Federal Democratic Republic of Ethiopia in Washington, D.C..
19th century Amhara altar, from the Brooklyn Museum in New York. Tadias Magazine is an Ethiopian American news source based inside New York, founded by its publisher Ethiopian immigrant Liben Eabisa. Other notable Ethiopian Americans residing in New York city include supermodel Liya Kebede, her husband and hedge fund manager Kassy Kebede, Swedish celebrity chef Marcus Samuelsson, and fashion designer Amsale Aberra. ^ "PLACE OF BIRTH FOR THE FOREIGN-BORN POPULATION IN THE UNITED STATES". U.S. Census Bureau. ^ "The Foreign-Born Population From Africa: 2008–2012" (PDF). U.S. Census Bureau. Retrieved 4 October 2016. ^ a b "Table 1. First, Second, and Total Responses to the Ancestry Question by Detailed Ancestry Code: 2000". U.S. Census Bureau. Retrieved 2013-04-19. ^ a b Mozgovaya, Natasha (2008-04-02). "Focus U.S.A.-Israel News – Haaretz Israeli News source". Haaretz.com. Retrieved 2010-12-25. ^ a b "Ten Largest African-Born Countries of Birth in the United States by Selected Metropolmericansitan Statistical Areas: 2008–2012" (PDF). US Census Bureau. Retrieved 12 September 2017. ^ Uhlig, Siegbert (2007). Encyclopaedia Aethiopica: He-N, Volume 3. Otto Harrassowitz Verlag. p. 20. ISBN 344705607X. ^ a b c Terrazas, Aaron (June 2007). "Beyond Regional Circularity: The Emergence of an Ethiopian Diaspora". Migration Information Source. Migration Policy Institute. Retrieved 2 March 2013. ^ a b c Chacko, Elizabeth (October 2003). "Identity and Assimilation Among Young Ethiopian Immigrants in Metropolitan Washington". Geographical Review. 93 (4): 491–506. doi: 10.1111/j.1931-0846.2003.tb00044.x. JSTOR 30033939. ^ Powell, John (2009). Encyclopedia of North American Immigration. Infobase Publishing. p. 94. ISBN 143811012X. ^ "PLACE OF BIRTH FOR THE FOREIGN-BORN POPULATION IN THE UNITED STATES, Universe: Foreign-born population excluding population born at sea, 2007-2011 American Community Survey 5-Year Estimates". United States Census Bureau. Retrieved 16 July 2013. ^ Nicholls, Walter (2005-05-18). "Washington's Little Ethiopia". The Washington Post. Retrieved 2011-11-15. The Washington region, with its 200,000 people of Ethiopian descent, has the largest Ethiopian population outside of the country itself, according to an unofficial estimate by the embassy. ^ Showalter, Misty. "Inside Washington D.C.'s 'Little Ethiopia'". CNN. The Ethiopian population in the Washington, D. C., metro area is the largest in the U.S. Tutu Belay, who has done extensive research on the population for her business, estimates it to be about 250,000 -- though other estimates are much lower. ^ Fernandez-Pereda, Cristina (2008-07-06). "Little Ethiopia: A Thriving Community in D.C." New America Media. Retrieved 2011-11-25. The number of Ethiopian citizens in the Washington, D.C. metro area varies all the time and no one has exact data on this population. According to the Ethiopian Embassy estimates, around 200,000 citizens in the metro area are of Ethiopian descent. The Ethiopian Community Center estimates around 150,000 people from the African country. ^ Shelemay, Kay Kaufman; Steven Kaplan (2006). "Introduction". Diaspora: A Journal of Transnational Studies. 15 (2/3): 191–213. doi: 10.1353/dsp.2011.0068. Retrieved 16 April 2013. ^ a b c Shelemay, Kay Kaufman (July 2–6, 2007). "Music of the Ethiopian American diaspora: A preliminary overview" (PDF). 16th International Conference of Ethiopian Studies: 1153, 1164. ^ a b "Ethiopians in Minnesota". Retrieved 18 March 2015. ^ "About Us". Ethiopian Community Center. Retrieved 13 November 2014. ^ Marie Price, Lisa Benton-Short (2008). Migrants to the Metropolis: The Rise of Immigrant Gateway Cities. Syracuse University Press. pp. 216–217 & 221. ISBN 0815631863. Retrieved 13 November 2014. ^ Balgopal, Pallassana R. (2013). Social Work Practice with Immigrants and Refugees. Columbia University Press. p. 136. ISBN 0231504187. Retrieved 13 November 2014. ^ "NY Abay Ethiopian Sports Club Home". Retrieved 18 March 2015. ^ "The ecstasy and the agony of Ethiopian marathoners - The Bronx Ink". Retrieved 18 March 2015. ^ "How Dallas Got So Many Ethiopian Restaurants". Retrieved 18 March 2015. ^ Xaykaothao, Doualy (26 February 2016). "MN Oromos decry human rights violations in Ethiopia, say violence continues". Minnesota Public Radio. Retrieved 26 February 2016.